Binoculars and spotting scopes from MINOX always offer cutting-edge technology and highest quality in all product classes, with an outstanding price/performance ratio. The MINOX BV 8x42 and MINOX BV 10x42 stand out with the renowned design and performance features that MINOX Sport Optics is famous for. Excellently suited for universal application in all fields of hunting and gamekeeping, as well as for the observation of flora and fauna in the wild. With their state-of-the-art optical systems the new BV 8x42 and BV 10x42 guarantee outstanding viewing quality and enjoyment. These systems feature multicoated lens elements that minimize reflections and provide an exceptionally high light transmission as well as neutral color rendition of the subjects in view. Thanks to roof prisms with phasecorrection coating the user can enjoy an image with excellent detail rendition and high image contrast - even in low light conditions. 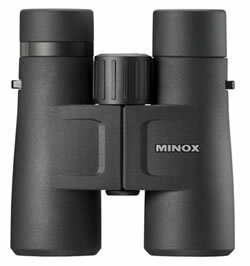 Optionally fitted with an 8x or 10x magnification the MINOX BV binoculars are the ideal all-purpose companion for hunters and nature observers who want to keep hold of the smallest detail of the subject spotted in the field. The extremely slim figure that is made possible by using modern roof prisms and the excellent grip provided by the rubber armoring make the BV binoculars good to hold without causing fatigue. The sturdy aluminum body guarantees reliable functioning of the optical systems and precision mechanics that are protected against dust and water using an innovative sealing technology. The BV 8x42 and BV 10x42 reliably withstand moisture penetration up to a pressure of 0.3 bar or a comparable water depth of three meters. A nitrogen filling on the inside of the binoculars provides permanent corrosion protection and prevents fogging of the glass surfaces, even with severe temperature fluctuations. With their extended eye relief and twist-type rubber eye cups with click stops the binoculars of the new BV line ideally meet the individual requirements of people wearing eyeglasses, enabling them to enjoy the entire field of view without vignetting. The scope of delivery of the new BV binoculars includes a neoprene strap, an eyepiece cap and an ever-ready case. Magnification: 8x  Front lens diameter: 42 mm / 1.65 in  Exit pupil: 5,25 mm / 0.21 in  Field of view: 129 m / 1000 m, 7,4° 389 ft / 1000 yds, 7.4°  Eye relief: 18 mm / 0.71 in  Close distance: 1,2 m / 3.94 ft  Diopter adjustment: -4 up to +8 dpt  Geom. twilight number: 18.3  Operating temperature: -10° up to +50° C  14° up to 122° F  Waterproof: yes, down to 3m / 9.85 ft  Height, Width, Depth: 140 x 127 x 51 mm, 5.5 x 5.0 x 2.0 in  Weight, approx: ca. 780 g / 27.5 oz. Magnification: 10x  Front lens diameter: 42 mm / 1.65 in  Exit pupil: 4,2 mm / 0.165 in  Field of view: 113 m / 1000 m, 6,5°342 ft / 1000 yds, 6.5°  Eye relief: 0.71 inch / 18.0 mm  Close distance: 1,2 m / 3.94 ft  Diopter adjustment: -4 up to +8 dpt  Geom. twilight number: 20.5  Operating temperature: -10° up to +50° C, 14° up to 122° F  Waterproof: yes, down to 3m / 9.85 ft  Height, Width, Depth: 140 x 127 x 51 mm, 5.5 x 5.0 x 2.0 in  Weight, approx: ca. 780 g / 27.5 oz.